Remodeling can take on many forms, and they all have the ability to transform a space within your home. 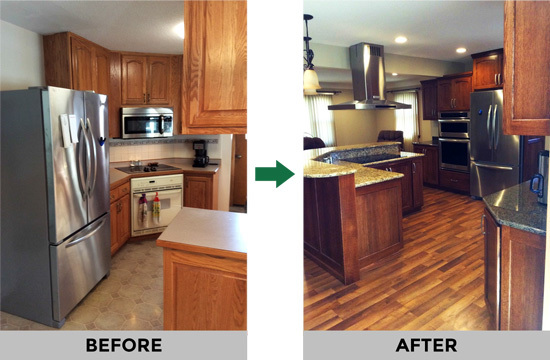 Depending on the size of the project, a remodel can transform your entire home itself. Working through your remodeling needs and collaborating on a project scope that fits your budget is our priority. We make the process easy, and we’ll give your project the attention and craftsmanship it deserves. What space is being remodeled? What do you need access to? I can help answer these questions. Do you have a plan or some ideas of what kind of remodel you would like? I have drafting services available to help us for this, and the ability to customize a project to fit your budget. Everyone should have a number for the final cost of their remodel that they are comfortable with. I can help guide you in this area, and I also offer construction financing for the build. Everyone has a lot of questions about the building process and timelines. We will go over any questions and concerns you have about the building process and timelines, and construction materials and care. I tell customers to always feel comfortable asking me about their concerns or sharing ideas they have. If you think of something after our meetings I am only a phone call or text message away. After this initial meeting, I will have some preliminary plans drawn up for review at our next meeting. Once we have preliminary plans drawn we will get together and go over them and make any changes necessary. We will also discuss some of the details of the remodel such as: building material, colors, finishes, lighting, trim, plumbing, electrical, and access to the rest of your home. It may take a couple of meetings and several emails to get the remodeling project exactly as you want it. When we have the plans done I will put together a detailed estimate for you. We will then go over this estimate. Once you have made the decision to proceed, we will sign contracts and begin the building process. I will help you in this process and give you timelines and vendors needed for selections. Construction times for remodels vary greatly. We will estimate a timeline once the scope of the remodel has been finalized. When the remodel is completed we will have a final walk through to make sure everything is ready for use. We understand that every client is different. Some want to have weekly meetings, and some are content to just meet when necessary. I am a custom home builder, and I will work with you personally and make myself available to you whenever you, as the homeowner feel it is necessary. Send us a message using our form, or give us a call directly. Copyright © 2016–2019 Todd Nelson Construction. All rights reserved. Website by Ecliptic Technologies, Inc.